A magnificent 1964-D! You would never guess this is a Mint State example with its lustrous, glass-like surfaces with scarcely a mark on it. Beautiful metal flow on this blast-white blazer! 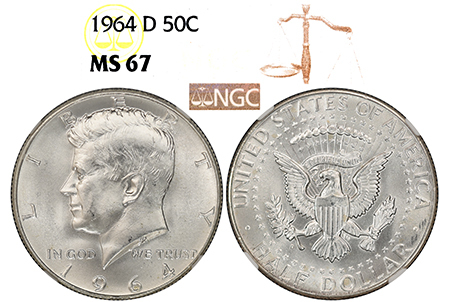 NGC has graded 6,280 examples total in gem condition! Only 20 examples have been graded MS 67 with NONE graded MS 68! Extremely scarce condition for a 1964-D MS!